Carlos is the character I am most worried about. I’d only spent a few hours with him before, and I am not sure what he will reveal about his time in Angola and how that will fit into the film. 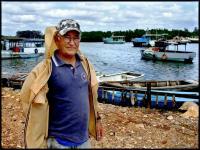 He is a fisherman, his skin deeply tanned from a lifetime at sea.